Apples of Gold Jewelry offers customers a wide variety of Christian jewelry, and this high quality women's polished flat cross pendant is a simple and stylish way to symbolize your faith! This beautiful cross pendant, which is crafted from 14K yellow gold, is s soft, polished pendant that is almost flat, creating a unique and interesting design. The pendant measures 17mm in width and 30mm in length, and is the perfect size for wearing every day. 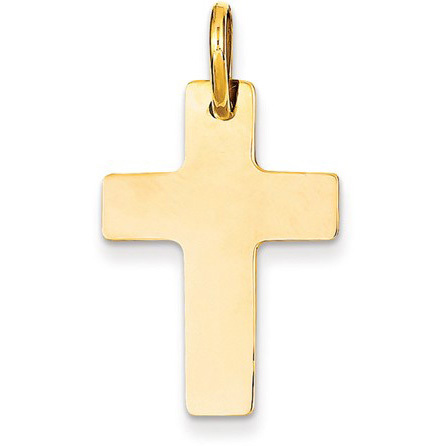 We guarantee our Women's Polished Flat Cross Pendant in 14K Yellow Gold to be high quality, authentic jewelry, as described above.